Having tasted success as Athletic Performance Associate for the San Antonio Spurs, Matt Herring is looking to the NHL for his next BIG win. Two years ago, Matt Herring was given the opportunity of a lifetime when he was offered a job as Athletic Performance Associate for the San Antonio Spurs in Texas. Fast forward to last month. 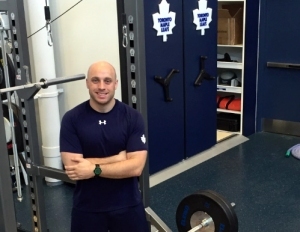 Matt moved from sunny Texas all the way north to Toronto for a new gig – Head Strength & Conditioning Coach for the Toronto Maple Leafs in the NHL. The 29-year-old hockey fan credits hard work and developing great relationships as the key to his success. He attended Saltus Grammar School followed by the University of Wales, Swansea, graduating with a BSc. (Hons) in Sports Science. He then completed a MSc. in Strength and Conditioning at the University of Edinburgh. His professional career started at Peak Performance Project (P3) in Santa Barbara, California where he worked under Dr. Marcus Elliott. He then moved to the University of California, Santa Barbara as the Athletic Performance Specialist, assisting Dr. Jeremy Bettle, Head Strength & Conditioning Coach. Following this tenure, he moved back to Bermuda and started Rhino Training and 18 months later was offered the position with the Spurs. Asked how the Maple Leafs job came about, Matt said: “While working under Dr. Bettle at UCSB, we formed a strong partnership which fostered an environment of hard work, innovation and accountability. We worked well together and trusted each other’s judgements and training methods. It has always been our intention to work together again. “While I was at the San Antonio Spurs, Jeremy was the Head Strength & Conditioning Coach for the Brooklyn Nets. We would regularly compete against each other, but our friendship and mutual respect remained strong. “Jeremy accepted the position of Director of Sports Science for the Toronto Maple Leafs and in turn approached me for the position of Head Strength and Conditioning Coach. It was an extremely difficult and emotional decision for me to leave the Spurs and one I took very seriously. Discussing the differences between working the NHL and the NBA, Matt said: “In a nutshell, hockey players basically have to be absolute animals who can take high impact collisions, go all out and recover for their regular 45 second shifts, as well as being tactically and skillfully sound. “Basketball players play a much more aerobic game that has significantly lower amounts of impact from contact. Due to these differences in demands, a hockey player has to be as durable and powerful as possible. Matt said while he is enjoying his new position, he does miss working with his former players and colleagues in San Antonio. The team won an NBA championship during his first season with them. Asked what advice he would give young Bermudians looking to achieve their goals and dreams, Matt said: “Don’t give in to self-doubt. It is tough for us as a people because many of us have a small island mentality that makes us think that international success may be beyond our reach. “There is no reason why young Bermudians can’t strive to be at the top of a major corporation or international sports team. But this doesn’t mean that we have to adapt to a certain mold, we can do it in our own distinctly Bermudian way.